Imagine a simple drawing showing a group of men, women and children who appear to be of Palestinian origin, frantically fleeing a series of armoured tanks and soldiers brandishing guns and dressed in green uniforms. The faces of the soldiers are too small to make out clearly but, if you look closely enough, you will see what appears to be the Star of David on one of the tanks. Now imagine that drawing as part of a lesson plan for secondary school students on the right to humanitarian treatment. If you assumed this was a lesson plan for Palestine refugees, you’d be right. When I saw this image in a lesson plan a few months ago I said to a friend, “Why is this in here? What possible good does it serve to show Palestinian civilians attacked by Israeli soldiers?” He didn’t have an answer. On the plus side, it didn’t appear as though any teachers regularly used the lesson. Forget from year to year. Things were relatively calm when I entered Gaza a couple of Fridays ago, and within 48 hours there were rocket and mortar attacks at the border when I crossed back into Israel. Since then the assaults have become deadlier by the day with, hopefully, a lasting ceasefire that has just taken effect. Regardless of the ever-changing situation in Gaza, what children learn about related to human rights should reflect a positive outlook. Even though a curriculum showing that “you’re oppressed and things aren’t getting any better” may be accurate, I doubt it’s in the best interests of children. This doesn’t mean that difficult issues around the rights of Palestine refugees should never be addressed in schools. They must, if children are to become active participants in creating a culture of human rights. In order for that to happen, though, teachers must have the proper skills to engage students into critically reflecting on their lives using a language based on human rights. The schools are closed. No wait that’s not true. They’re open but filled with families who fled their homes seeking refuge from the aerial strikes. The teachers I gave the workshop to won’t be teaching, they’ll be hunkered down in classrooms protecting their families or held hostage at home doing the same. Their routine of teaching children hope in a hopeless land just got a lot worse. The reality of their lives, already frighteningly tenuous, makes the stuff I showed them seem preposterously naïve. 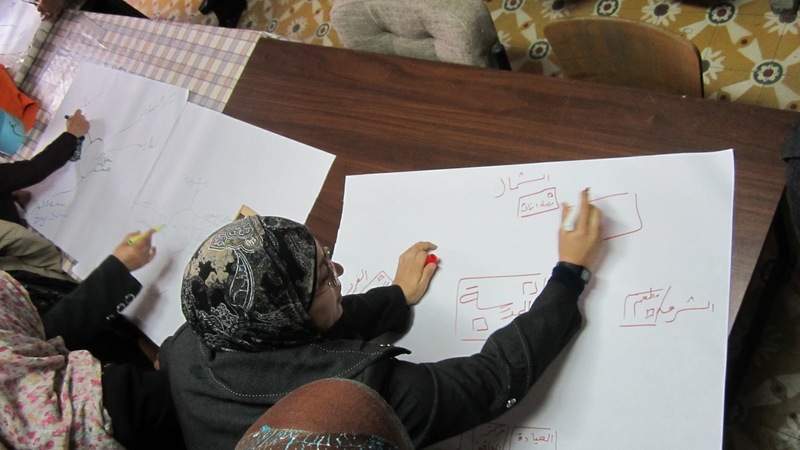 Drawing community maps and making links with human rights. A Grade 4 student from an UNRWA school– a young girl my son’s age – was killed by an Israeli air strike November 18; an UNRWA teacher at a boys’ school was killed in an attack last week. I think of their deaths and wonder of the futility of teaching about human rights in a place like Gaza. The young girl, had she survived, could have eventually participated in one of the toolkit activities where she and her classmates create a community map using paper and coloured pencils. They would draw different places in the community where rights are present – the mosque (the right to practice your religion, Article 18 of the Universal Declaration of Human Rights), their homes (the right to housing, Article 25), the beach (the right to rest, Article 24), the health clinic (the right to health, Article 25). The activity is called “Rights all around me” and is meant to show that, however dire your living conditions, there is still some scrap of dignity amidst your depressing surroundings that proves you are a human being and you deserve to be treated as such. Now any map would be filled with bombed-out craters, black holes where homes, mosques and pathetic health clinics used to stand. I want teachers to present a positive outlook for their students but the damn bombs, the killings, the destruction always get in the way. As if that weren’t bad enough, an apparent “Israeli spy” was just killed and dragged through the streets of Gaza City by motorcycle as children looked on. I can’t help but think What the hell are you doing? John Lennon’s Imaginepops in and out of my head a lot these days. This isn’t the time for futility, I tell myself. Teachers want to learn about human rights because they know things have to change, if not for themselves then for their children. The bombs will stop, the dust will clear, the victims mourned, and somehow the children will learn a language of peace.